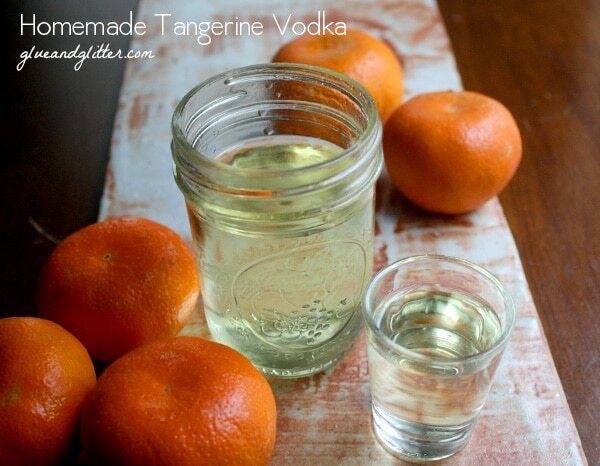 Tangerine infused vodka is so easy to make, y’all. Let’s infuse some booze! I know. Just last week I was all “I’m going to make healthier drinks!” And here I am today infusing booze. But you guys, I had an idea for a cocktail recipe that’s going to require tangerine infused vodka. Soonest begun, soonest done, I say. Booze infusions are such a simple way to make basic cocktails feel super fancy. You don’t need to do a lot of work. You just need a bit of patience. If you start making this infused vodka over the weekend or even on Monday evening, it will be ready in time for the Friday Cocktail recipe I have planned for next week. Let’s cook along together! Oh, and in a true Mom of the Year moment, I totally let Darrol Henry “help” with this recipe. 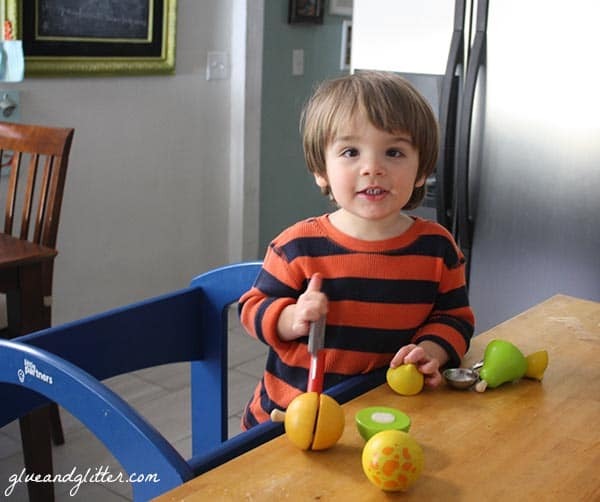 While I sliced zest off of tangerines, he helped out by cutting up pears, oranges, mushrooms, and lemons for a salad of his own. If you’re new to making infused vodka and other boozy infusions, here’s the basic recipe. You may need to tinker with times and amounts for some ingredients, but for most fruits and herbs this is a good jumping-off point for making pretty much any infused booze you like. Get yourself a clean, glass jar. Put your stuff inside. 1 tablespoon of goods to 1 cup booze usually works well. Citrus zest, fresh herbs, apple or pear peels, or sliced stone fruits all work well. Stick the jar somewhere cool and dark. If it’s cold in your house, stick it in the pantry. If it’s hot, stick it in the fridge. Shake it. Every day, pull our your jar, and give it a shake. It’s ok if you miss a day here and there, but try to remember, okay? Smell it. Starting on day 3, open the jar and give it a sniff after you shake. Does it smell nice and fruity/herbal? It might be ready! Give it a taste. If the infused flavor still isn’t strong enough for your liking, stick it back on the shelf, and try again tomorrow. Strain it. Use cheesecloth, a coffee filter, or a mesh strainer to strain your infused booze into another glass container. It should keep for ages and ages in the fridge. If you’re feeling a little bit lazy, you can also just fish the pieces out with a fork. I won’t tell. But you might end up with some sediment in your jar, depending on what you put in there. You can also see that I was a little bit cavalier about getting the pith off of my tangerine zest. You might want to be a bit more thorough than I was, though my tangerine vodka turned out a-OK. If you can’t find good tangerines at the grocery store, you can use orange zest in place of tangerine zest. I really like the extra tang that tangerine lends this vodka infusion, but the recipe is definitely flexible. You can serve this vodka on the rocks, with a splash of soda water, or wait until next Friday, when I’ll have a tangerine infused vodka cocktail recipe for you! 2 tablespoons tangerine zest – Do not mince! Big pieces are better, because they will strain out more easily. 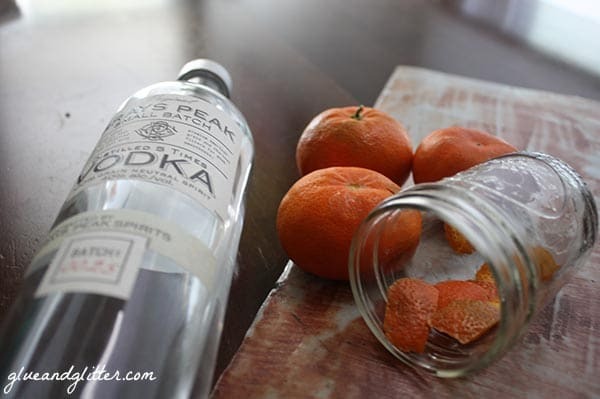 Put the orange zest into the bottom of a half pint Mason jar, and top off the jar with vodka. Give it a shake, and stick it into the fridge for around 5 days, shaking the jar once a day. On day 3, you’ll want to open the jar and give it a sniff. Does it smell tangerine-y enough? Then you’re done! No? 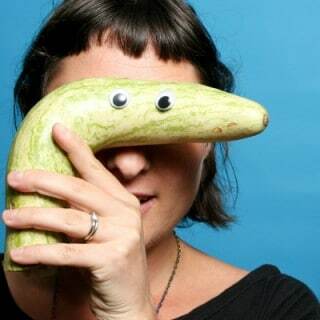 Stick it back into the fridge, and sniff again tomorrow. Keep the zest in there until the vodka is infused to your liking. 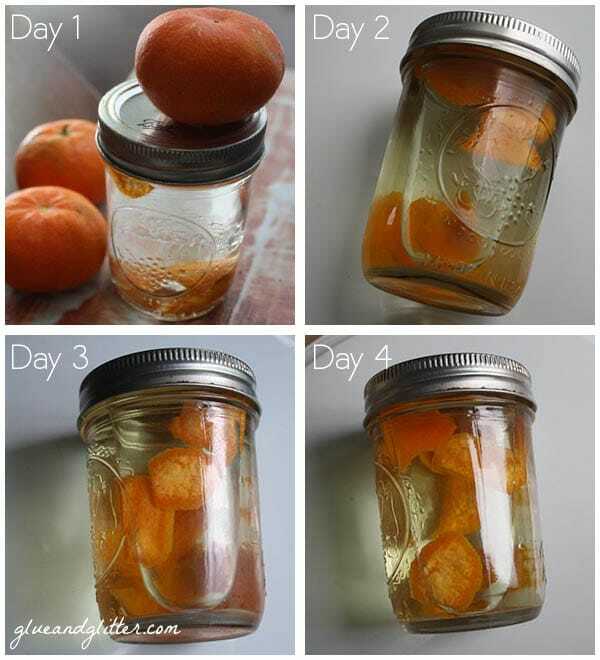 When the vodka smells nice and citrusy, either strain through cheesecloth into another glass container or just fish the tangerine zest out with a fork. Store in the refrigerator. This stuff keeps for a long, long time. Months, at least. Maybe even a year, if you’re brave.